Kids love Dinosaurs and love our Dinosaur designs; and we have a request to create dinosaur bones / skeletons design - so here it is! We think it turned out to be awesome. Our Dinosaur Skeletons design features a number of dino skeletons on a light yellow background. Dino skeletons include Iguanodon, Laosurus, Camptosaurus, Lariosaurus, brontosaurus, triceratops, claosaurus, cerotosaurus and many others. 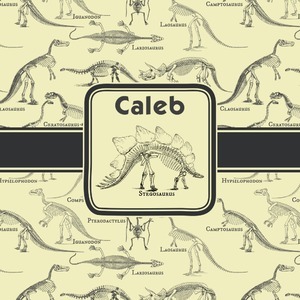 We chose to feature our design with a dark grey classic ribbon, a square label featuring the Stegosaurus Skeleton along with the child's name for personalization. All the Dinosaur Skeletons are available in our system - so you can your child's favorite dino and feature it.